A simple recipe for beer boiled shrimp. All you need is shrimp and a few ingredients you may already have. 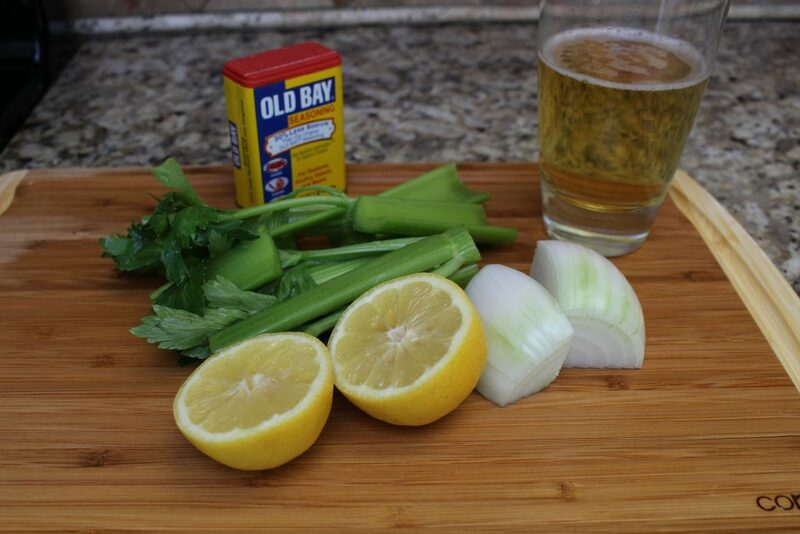 Celery, onion, lemons, and a touch of Old Bay are boiled in beer and water. Allowing the beer bath to simmer for a bit will enhance the flavors before adding the shrimp. This beer-boiled shrimp recipe can be doubled, tripled and even more. The only limitations you will have are the size of your pan and your budget! I have cooked up to 5 pounds of shrimp in the beer bath without increasing that portion of the recipe. It can be served hot or cold so you can make it while your company waits or make it earlier in the day and avoid kitchen detail when guests arrive. Add as much shrimp as you need. You can have enough for 2 or enough beer boiled shrimp for a crowd. 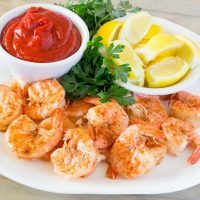 The shrimp for this recipe can be of the frozen variety or “fresh” from the fish/meat department. In parts of the country not blessed with miles of shoreline, that “fresh” shrimp was more than likely frozen and allowed to sit in that glass case. Save the money and buy frozen if that is your case. The only request I have when you make this is to use shrimp with the shells still on. De-veined is fine, actually preferred as it cuts out the step of cleaning shrimp. These are also easier for guests to peel and you don’t have to watch them fight with mud veins. A word of advice, remove all of the onions, celery, and lemons out of the broth before adding the shrimp. Simmering the beer bath and then letting the shrimp chill out in it takes longer than the actual cooking of the shrimp. You have to be quick with getting these out of the bath or getting the bath cooled down after cooking or you will have some tough shrimp. No one likes tough beer boiled shrimp. 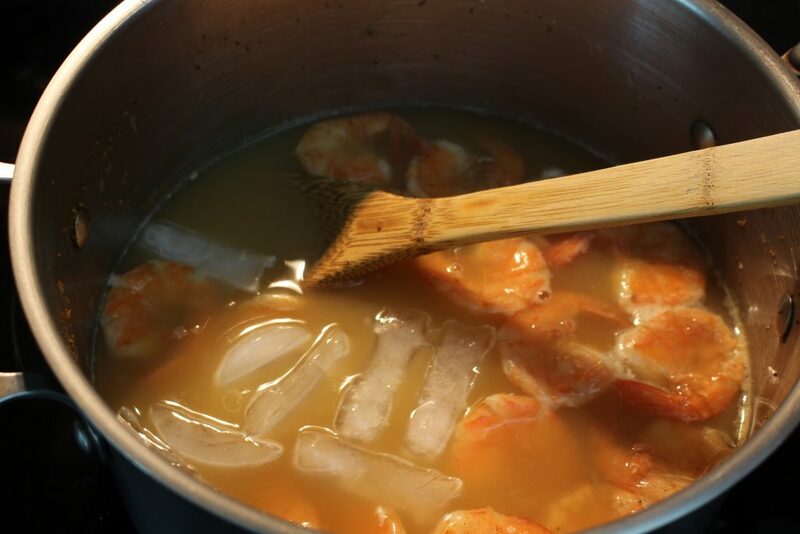 While the shrimp is coming up to a boil, fill a bowl with ice. As soon as the shrimp are all floating, the shrimp are done. Remove the pot off the heat source and immediately add the ice to stop the cooking process. Use just enough to stop the cooking process, but not so much ice that it makes the shrimp cold. Now you just let the shrimp sit in the beer bath until you are ready to serve. This beer bath from this beer-boiled shrimp recipe can be used as a base for an entire shrimp boil too. You will want to make sure that your potatoes, corn, and sausage are completely cooked through before adding the shrimp. Even with a shrimp boil, you want to stop the shrimp from cooking as soon as they float to the top. If you need extra time to finish cooking any of the other ingredients while the shrimp are in the liquid, the shrimp are going to be overcooked. The shrimp shouldn’t take any longer than 3 to 5 minutes after the beer bath comes back to a boil. Once the beer-boiled shrimp have been plated, go ahead and give them a good dusting of Old Bay seasoning. You can be generous with the seasoning, some of it will be discarded with the shrimp shells. I serve these with cocktail sauce, lemon wedges, lots of napkins, and a bowl on the side for discarding shrimp shells. Make sure and use a gluten-free beer if you are feeding any folks with celiac disease or a gluten allergy! Shrimp cooked in a simple, yet delicious, beer bath. Can be served hot or cold. In a large pot bring beer, water, lemon, celery, onion, and Old Bay to a boil. Reduce heat and simmer until celery and onions are limp. 30 to 60 minutes. Remove celery, onions, and lemon. Bring the liquid back to a boil and add shrimp. Frozen shrimp is fine. Boil just until shrimp floats. Add 2 cups of ice to shrimp and liquid. 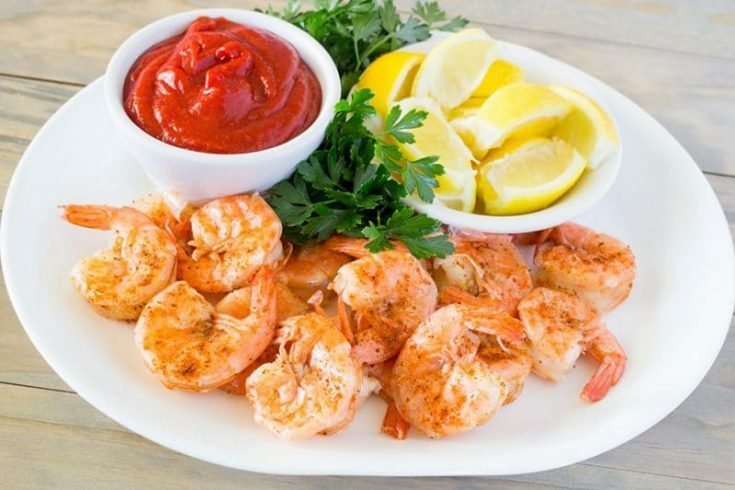 Allow shrimp to steep in water for 15 to 30 minutes. 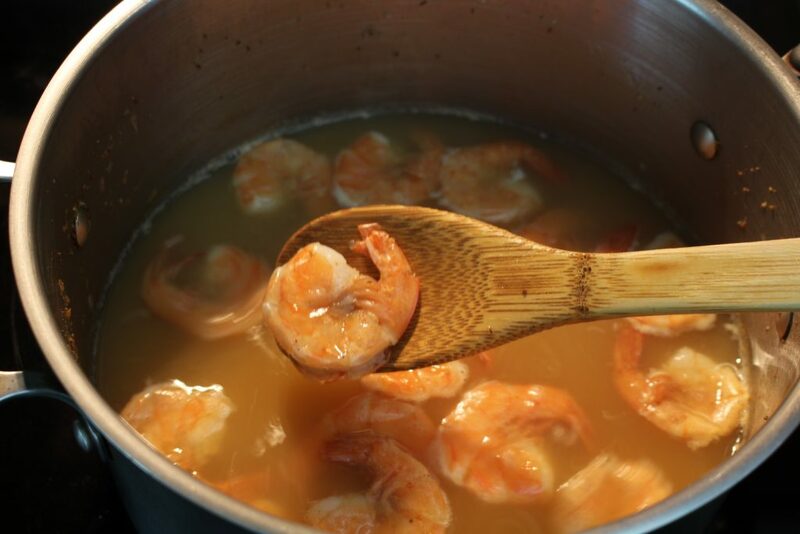 Remove shrimp from liquid and serve warm or refrigerate and serve cold. Sprinkle with additional Old Bay seasoning if desired. Serve with lemon wedges, cocktail sauce, and plenty of napkins. Any size shrimp can be used, just cook until shrimp float. Time will vary by size of shrimp. Frozen shrimp should also just be cooked until they float.